envision, set goals, determine a method to reach a goal and try it out, identify alterna­tives, evaluate, revise, solve problems, imag­ine, work collaboratively, and apply self-discipline. As they study and create in the arts, students use the potential of the human mind to its full and unique capacity. The vi­sual and performing arts are a vital part of a well-rounded educational program for all students. Move in a variety of directed ways. Name the opposites in basic movements (e.g., big/small). Create movements that reflect a variety of daily tasks and activities. Respond to visual and sound stimuli (e.g., bubbles, feathers, bell, clock, ball) with original movement. Describe how everyday movements can be used in dance (e.g., walk quickly, stretch slowly). Build the range and capacity to move in a variety of ways. Understand and respond to a wide range of opposites (e.g., high/low, forward/back­ward, wiggle/freeze). Perform simple movements in response to oral instructions (e.g., walk, turn, reach). Create movements that reflect a variety of personal experiences (e.g., recall feeling happy, sad, angry, excited ). Respond to a variety of stimuli (e.g., sounds, words, songs, props, and images) with original movements. Demonstrate the ability to vary control and direct force/energy used in basic locomotor and axial movements (e.g., skip lightly, turn strongly, fall heavily). Perform short movement problems, emphasizing the element of space (e.g., shapes/lines, big/small, high/low). Name basic locomotor and axial movements (e.g., skip, slide, stretch, roll). Use improvisation to discover movements in response to a specific movement problem (e.g., find a variety of ways to walk; create five types of circular movement). Respond in movement to a wide range of stimuli (e.g., music, books, pictures, rhymes, fabrics, props). Create a short movement sequence with a beginning, a middle, and an end. Create shapes and movements at low, middle, and high levels. Express basic emotional qualities (e.g., angry, sad, excited, happy) through movement. Perform improvised movement ideas for peers. Work with others in a group to solve a specific dance problem (e.g., design three shapes—high, medium, and low; create slow and fast movements). Name and perform folk/traditional dances from other countries. Describe aspects of the style, costumes, and music of a dance. Identify where and when people dance. Use basic dance vocabulary to identify and describe a dance observed or performed (e.g., shapes, levels, directions, tempo/fast-slow). Describe the experience of dancing two different dances (e.g., Seven Jumps, La Raspa). Describe how they communicate an idea or a mood in a dance (e.g., with exaggerated everyday gesture or emotional energies). Show a variety of combinations of basic locomotor skills (e.g., walk and run, gallop and jump, hop and skip, slide and roll). Show a variety of combinations of axial movements (e.g., swing and balanced shapes, turn and stretch, bend and twist). Perform short movement problems, emphasizing the element of time (e.g., varied tem­pos, rhythmic patterns, counting). Expand the ability to incorporate spatial concepts with movement problems. Name a large number of locomotor and axial movements used in dance. Create and improvise movement patterns and sequences. Demonstrate multiple solutions in response to a given movement problem (e.g., In how many ways can you travel from point A to point B?). Create a simple sequence of movement with a beginning, a middle, and an end, incorpo­rating level and directional changes. Create shapes and movements, using fast and slow tempos. Develop a dance phrase that has a sense of unity. Create, memorize, and perform original expressive movements for peers. Work cooperatively in small and large groups. Demonstrate partner skills (e.g., imitating and leading/following). Use basic dance vocabulary to name and describe a dance observed or performed (e.g., levels, rhythm patterns, type of energy). Describe how the movement in dances of peers communicates ideas or moods to the viewer (e.g., ocean environment or a sad or joyous dance). Use literature to inspire dance ideas (e.g., poem, cartoon, nursery rhyme). Demonstrate language arts concepts through dance (e.g., show different punctuation marks through movement). Describe how choreographers create dances. Describe how dancing requires good health-related habits (e.g., adequate nutrition, water, and rest; proper preparation for physical activity). Combine and perform basic locomotor skills, moving on a specific pathway (e.g., skip in circles, slide in zigzags, run in a variety of linear paths). Combine and perform locomotor and axial movements (e.g., walk and turn, stretch and slide). Demonstrate the ability to start, change, and stop movement. Perform short movement problems, emphasizing the element of force/energy (e.g., swing, melt, explode, quiver). Create and perform complex improvised movement patterns, dance sequences, and studies. Improvise and select multiple possibilities to solve a given movement problem (e.g., find four different ways to combine a turn, stretch, and jump). Create a sequence that has a beginning, a middle, and an end. Name and refine the parts of the sequence. Perform dances to communicate personal meaning, using focus and expression. Compare and contrast the role of the performer with that of a member of the audience. Demonstrate a variety of partner skills (e.g., imitation, leading/following, mirroring). Describe commonalities among and differences between dances from various countries. Describe and demonstrate ceremonial and folk/traditional dances that show work activities (e.g., harvesting, fishing, weaving). Explain the function of dance in ceremonial and social community events in Native American cultures. Name specific criteria to assess the quality of a dance performance of peers (e.g., focus, level of personal involvement, physical control). Explain and demonstrate what it means to be a good audience member. Explain how a performer’s dance skills contribute to communication of ideas and moods when performing a dance (e.g., focus, strength, coordination). Demonstrate mental concentration and physical control in performing dance skills. Demonstrate increased range and use of space, time, and force/energy concepts (e.g., pulse/accents, melt/collapse, weak/strong). Explain the principles of variety, contrast, and unity and apply to a dance sequence. Describe a specific movement, using appropriate dance vocabulary. Create, develop, and memorize set movement patterns and sequences. Describe, discuss, and analyze the process used by choreographers to create a dance. Convey a range of feelings through shape/postures and movements when performing for peers. Perform improvised movement and dance studies with focus and expression. Demonstrate additional partner and group skills (e.g., imitating, leading/following, mirroring, calling/responding, echoing). Perform and identify dances from various countries with different arrangements of dancers (e.g., lines, circles, couples). Perform and describe dances that reflect the geographical place in which the dances are performed (e.g., deserts, rain forests, islands). Name and use specific criteria in assessing personal and professional dance choreogra­phy (e.g., contrast, phrasing, unity). Describe ways in which a dancer effectively communicates ideas and moods (strong technique, projection, and expression). Analyze the choreographic process and its relation to the writing process (e.g., brain­storming, exploring and developing ideas, putting ideas into a form, sequencing). Demonstrate focus, physical control (e.g., proper alignment, balance), and coordination in performing locomotor and axial movement. Name and use a wide variety of movements (e.g., isolations/whole body). Demonstrate a greater dynamic range in movement utilizing space, time, and force/ energy concepts. Create, memorize, and perform complex sequences of movement with greater focus, force/energy, and intent. Describe and incorporate simple dance forms in dance studies (e.g., AB form, canon). Demonstrate principles of opposing weight and force/energy, balance and counterbal­ance, or cantilever. Select traditional dances that men, women, or children perform and explain the purpose(s) of the dances. Use dance vocabulary to identify and support personal preferences for dances observed or performed. Apply specific criteria to analyze and assess the quality of a dance performance by well-known dancers or dance companies (e.g., technical skill, musicality, dynamics, mood). Describe how dancing requires good health-related habits (e.g., individual and group goals for flexibility, strength, endurance, stress management, nutrition). Invent multiple possibilities to solve a given movement problem and develop the material into a short study. Compare and demonstrate the difference between imitating movement and creating original material. Describe and incorporate dance forms in dance studies. Demonstrate the ability to coordinate movement with different musical rhythms and styles (e.g., ABA form, canon). Use the elements of dance to create short studies that demonstrate the development of ideas and thematic material. Demonstrate an awareness of the body as an instrument of expression when rehearsing and performing. Demonstrate an ability to cooperate and collaborate with a wide range of partners and groups (e.g., imitating, leading/following, mirroring, calling/responding, echoing, sequence building). Compare and contrast features of dances already performed from different countries. Explain the importance and function of dance in students’ lives. Explain the various ways people have experienced dance in their daily lives (e.g., Roman entertainments, Asian religious ceremonies, baby naming in Ghana, Latin American celebrations). Apply knowledge of the elements of dance and the craft of choreography to critiquing (spatial design, variety, contrast, clear structure). Propose ways to revise choreography according to established assessment criteria. Discuss the experience of performing personal work for others. Distinguish the differences between viewing live and recorded dance performances. Describe how other arts disciplines are integrated into dance performances (e.g., music, lighting, set design). Describe the responsibilities a dancer has in maintaining health-related habits (e.g., balanced nutrition, regular exercise, adequate sleep). Identify careers in dance and dance-related fields (e.g., teacher, therapist, videographer, dance critic, choreographer, notator). Use icons or invented symbols to represent musical sounds and ideas. Identify the sources of a wide variety of sounds. Move or use body percussion to demonstrate awareness of beat and tempo. Use the voice to speak, chant, and sing. Improvise simple instrumental accompaniments to songs, recorded selections, stories, and poems. Use a personal vocabulary to describe music from diverse cultures. 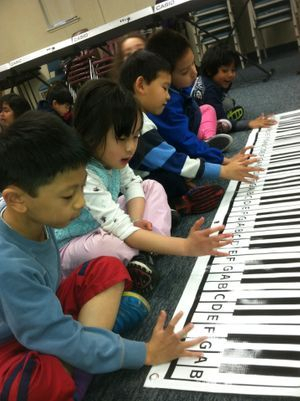 Use developmentally appropriate movements in responding to music from various genres and periods (rhythm). Create movements in response to music. Participate freely in musical activities. Demonstrate an awareness of music as a part of daily life. Use icons or invented symbols to represent beat. Identify and describe basic elements in music (e.g., high/low, fast/slow, loud/soft, beat). Use the singing voice to echo short melodic patterns. Sing age-appropriate songs from memory. 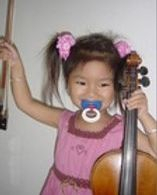 Play instruments and move or verbalize to demonstrate awareness of beat, tempo, dynamics, and melodic direction. Identify the various uses of music in daily experiences. Sing and play simple singing games from various cultures. Use a personal vocabulary to describe voices and instruments from diverse cultures. Use developmentally appropriate movements in responding to music from various genres and styles (rhythm, melody). Create movements that correspond to specific music. Identify, talk about, sing, or play music written for specific purposes (e.g., work song, lullaby). Use music, together with dance, theatre, and the visual arts, for storytelling. Read, write, and perform simple patterns of rhythm and pitch, using beat, rest, and divided beat (two sounds on one beat). Identify simple musical forms (e.g., phrase, AB, echo). Identify common instruments visually and aurally in a variety of music. Sing with accuracy in a developmentally appropriate range. Play simple accompaniments on classroom instruments. Improvise simple rhythmic accompaniments, using body percussion or classroom instruments. Recognize and talk about music and celebrations of the cultures represented in the school population. Use the vocabulary of theatre, such as pretend, imagination, movement, puppetry,and audience, to describe theatrical experiences. Identify characteristic movements and sounds of animate and inanimate objects. 5.1Use body, voice, and imagination to illustrate concepts in other content areas. Use movement and voice, for example, to reinforce vocabulary, such as big, little, loud, and quiet. Use the vocabulary of theatre, such as actor, character, cooperation, setting, the five senses, and audience, to describe theatrical experiences. Identify differences between real people and imaginary characters. 2.1Perform imitative movements, rhythmical activities, and theatre games (freeze, statues, and mirrors). Perform group pantomimes and improvisations to retell familiar stories. 3.1Retell or dramatize stories, myths, fables, and fairy tales from various cultures and times. Portray different community members, such as firefighters, family, teachers, and clerks, through role-playing activities. 4.1Respond appropriately to a theatrical experience as an audience member. 5.1Dramatize information from other content areas. Use movement and voice, for example, to reinforce vocabulary, such as fast, slow, in, on, through, over, under. Demonstrate the ability to participate cooperatively in performing a pantomime or dramatizing a story. Use the vocabulary of the theatre, such as ay, plot (beginning, middle, and end), improvisa­tion, pantomime, stage, character,and audience, to describe theatrical experiences. 2.1Demonstrate skills in pantomime, tableau, and improvisation. 3.1 Identify the cultural and geographic origins of stories. Identify theatrical conventions, such as props, costumes, masks, and sets. 4.1Describe what was liked about a theatrical work or a story. 5.1Apply the theatrical concept of beginning, middle, and end to other content areas. For example, act out the life cycle of a butterfly. Demonstrate the ability to work cooperatively in presenting a tableau, an improvisation, or a pantomime. Use the vocabulary of theatre, such as plot (beginning, middle,and end), scene, sets, conflict, script,and audience, to describe theatrical experiences. 2.1Perform in group improvisational theatrical games that develop cooperative skills and concentration. Retell familiar stories, sequencing story points and identifying character, setting, and conflict. Use improvisation to portray such concepts as friendship, hunger, or seasons. 3.1Identify theatre and storytelling forms from different cultures. 4.1Critique an actor’s performance as to the use of voice, gesture, facial expression, and movement to create character. Respond to a live performance with appropriate audience behavior. Identify the message or moral of a work of theatre. 5.1 Use problem-solving and cooperative skills in dramatizing a story, a current event, or a concept from another subject area. Use the vocabulary of theatre, such as character, setting, conflict, audience, motivation, props, stage areas, and blocking, to describe theatrical experiences. 2.1Participate in cooperative scriptwriting or improvisations that incorporate the five Ws. Create for classmates simple scripts that demonstrate knowledge of basic blocking and stage areas. 3.1Dramatize different cultural versions of similar stories from around the world. 4.1Develop and apply appropriate criteria or rubrics for evaluating a theatrical experience. Compare the content or message in two different works of theatre. 5.1Use problem-solving and cooperative skills to dramatize a story or a current event from another content area, with emphasis on the five Ws. Use the vocabulary of theatre, such as plot, conflict, climax, resolution, tone, objectives, motivation, and stock characters, to describe theatrical experiences. Identify a character’s objectives and motivations to explain that character’s behavior. Demonstrate how voice (diction, pace, and volume) may be used to explore multiple possibilities for a live reading. 2.1 Demonstrate the emotional traits of a character through gesture and action. Retell or improvise stories from classroom literature in a variety of tones (gossipy, sorrowful, comic, frightened, joyful, sarcastic). Role and Cultural Significance of Theatre. 3.1 Identify theatrical or storytelling traditions in the cultures of ethnic groups throughout the history of California. Recognize key developments in the entertainment industry in California, such as the introduction of silent movies, animation, radio and television broadcasting, and interac­tive video. 4.1Develop and apply appropriate criteria or rubrics for critiquing performances as to characterization, diction, pacing, gesture, and movement. Compare and contrast the impact on the audience of theatre, film, television, radio, and other media. 5.1 Dramatize events in California history. Use improvisation and dramatization to explore concepts in other content areas. Exhibit team identity and commitment to purpose when participating in theatrical experiences. Identify the structural elements of plot (exposition, complication, crisis, climax, and resolution) in a script or theatrical experience. 2.1Participate in improvisational activities to explore complex ideas and universal themes in literature and life. Demonstrate the use of blocking (stage areas, levels, and actor’s position, such as full front, quarter, profile, and full back) in dramatizations. 3.1Select or create appropriate props, sets, and costumes for a cultural celebration or pag­eant. Interpret how theatre and storytelling forms (past and present) of various cultural groups may reflect their beliefs and traditions. Analyze ways in which theatre, television, and film play a part in our daily lives. Identify types of early American theatre, such as melodrama and musical theatre. 4.1Develop and apply appropriate criteria for critiquing the work of actors, directors, writers, and technical artists in theatre, film, and video. 5.1 Use theatrical skills to dramatize events and concepts from other curriculum areas, such as reenacting the signing of the Declaration of Independence in history–social science. Identify the roles and responsibilities of performing and technical artists in theatre, film, television, and electronic media. Use the vocabulary of theatre, such as action/reaction, vocal projection, subtext, theme, mood, design, production values, and stage crew, to describe theatrical experiences. 2.1 Participate in improvisational activities, demonstrating an understanding of text, subtext, and context. 3.1Create scripts that reflect particular historical periods or cultures. Differentiate the theatrical traditions of cultures throughout the world, such as those in Ancient Greece, Egypt, China, and West Africa. 4.1Develop and apply appropriate criteria for evaluating sets, lighting, costumes, makeup, and props. Identify examples of how theatre, television, and film can influence or be influenced by politics and culture. 5.1 Use theatrical skills to communicate concepts or ideas from other curriculum areas, such as a demonstration in history–social science of how persuasion and propaganda are used in advertising. Research career opportunities in media, advertising, marketing, and interactive Web design. Discuss visual and tactile perceptions of the natural and human-made world: what is seen and how objects feel. 2.1Create patterns and three-dimensional arrangements (using manipulatives or blocks). Demonstrate beginning skill in the use of materials (such as pencils, paints, crayons, clay) to create works of art. Experiment with colors through the use of a variety of drawing materials and paints. Create a picture of a person. Use colors to draw or paint a picture of everyday objects. 3.1Identify art observed in daily life. Describe pictorial objects that appear in works of art. 4.1Discuss what is seen in works of art. Ask questions about works of art. Discuss what they like about their own works of art. Select works of art by others and tell what they like about it. 5.1Create visual patterns (e.g., line, line, dot; line, line, dot) to match rhythms made by clapping or drumming the beat found in selected poems or songs. Name colors and draw an object, using the colors (e.g., red balloon, greenl eaf, brown dog, yellow sun). Identify images of self, friends, and family (including snapshots and the students’ own works of art). Discuss how art is used to illustrate stories. Recognize and describe simple patterns found in the environment and works of art. Name art materials (e.g., clay, paint, crayons) introduced in lessons. Identify the elements of art (line, color, shape/form, texture, value, space) in the environ­ment and in works of art, emphasizing line, color, and shape/form. Demonstrate beginning skill in the use of tools and processes, such as the use of scissors, glue, and paper in creating a three-dimensional construction. Make a collage with cut or torn paper shapes/forms. Paint pictures expressing ideas about family and neighborhood. Use lines in drawings and paintings to express feelings. Use geometric shapes/forms (circle, triangle, square) in a work of art. Create a three-dimensional form, such as a real or imaginary animal. 3.1Describe functional and nonutilitarian art seen in daily life; that is, works of art that are used versus those that are only viewed. Identify and describe works of art that show people doing things together. Look at and discuss works of art from a variety of times and places. 4.1Discuss their own works of art, using appropriate art vocabulary (e.g., color, shape/form, texture). Describe what is seen (including both literal and expressive content) in selected works of art. Discuss how and why they made a specific work of art. Give reasons why they like a particular work of art they made, using appropriate art vocabulary. 5.1Draw geometric shapes/forms (e.g., circles, squares, triangles) and repeat them in dance/movement sequences. Look at and draw something used every day (e.g., scissors, toothbrush, fork) and de­scribe how the object is used. Point out images (e.g., photographs, paintings, murals, ceramics, sculptures) and sym­bols found at home, in school, and in the community, including national and state symbols and icons. Describe and replicate repeated patterns in nature, in the environment, and in works of art. Distinguish among various media when looking at works of art (e.g., clay, paints, draw­ing materials). Identify the elements of art in objects in nature, in the environment, and in works of art, emphasizing line, color, shape/form, and texture. 2.1Use texture in two-dimensional and three-dimensional works of art. Demonstrate beginning skill in the manipulation and use of sculptural materials (clay, paper, and papier maché) to create form and texture in works of art. Use visual and actual texture in original works of art. 3.1Recognize and discuss the design of everyday objects from various time periods and cultures. Identify and describe various subject matter in art (e.g., landscapes, seascapes, portraits, still life). View and then describe art from various cultures. Identify art objects from various cultures (e.g., Japanese screen painting, Mexican tin art, African masks) and describe what they have in common and how they differ. 4.1Discuss works of art created in the classroom, focusing on selected elements of art (e.g., shape/form, texture, line, color). Identify and describe various reasons for making art. Describe how and why they made a selected work of art, focusing on the media and technique. Select something they like about their work of art and something they would change. 5.1Clap out rhythmic patterns found in the lyrics of music and use symbols to create visual representations of the patterns. Compare and contrast objects of folk art from various time periods and cultures. Identify and sort pictures into categories according to the elements of art emphasized in the works (e.g., color, line, shape/form, texture). Identify the elements of art in objects in nature, the environment, and works of art, emphasizing line, color, shape/form, texture, and space. 2.1Demonstrate beginning skill in the use of basic tools and art-making processes, such as printing, crayon rubbings, collage, and stencils. Depict the illusion of depth (space) in a work of art, using overlapping shapes, relative size, and placement within the picture. Create a painting or drawing, using warm or cool colors expressively. 3.1Explain how artists use their work to share experiences or communicate ideas. Recognize and use the vocabulary of art to describe art objects from various cultures and time periods. Identify and discuss how art is used in events and celebrations in various cultures, past and present, including the use in their own lives. 4.1Compare ideas expressed through their own works of art with ideas expressed in the work of others. Compare different responses to the same work of art. Use the vocabulary of art to talk about what they wanted to do in their own works of art and how they succeeded. 5.1Use placement, overlapping, and size differences to show opposites (e.g., up/down, in/ out, over/under, together/apart, fast/slow, stop/go). Select and use expressive colors to create mood and show personality within a portrait of a hero from long ago or the recent past. Identify pictures and sort them into categories according to expressive qualities (e.g., theme and mood). Compare and contrast two works of art made by the use of different art tools and media (e.g., watercolor, tempera, computer). Identify and describe elements of art in works of art, emphasizing line, color, shape/ form, texture, space, and value. 2.1Explore ideas for art in a personal sketchbook. Paint or draw a landscape, seascape, or cityscape that shows the illusion of space. Create a work of art based on the observation of objects and scenes in daily life, empha­sizing value changes. Create an imaginative clay sculpture based on an organic form. Create an original work of art emphasizing rhythm and movement, using a selected printing process. 3.1Compare and describe various works of art that have a similar theme and were created at different time periods. Identify artists from his or her own community, county, or state and discuss local or regional art traditions. Distinguish and describe representational, abstract, and nonrepresentational works of art. Identify and describe objects of art from different parts of the world observed in visits to a museum or gallery (e.g., puppets, masks, containers). Write about a work of art that reflects a student’s own cultural background. Identify successful and less successful compositional and expressive qualities of their own works of art and describe what might be done to improve them. Select an artist’s work and, using appropriate vocabulary of art, explain its successful compositional and communicative qualities. 5.1Describe how costumes contribute to the meaning of a dance. Write a poem or story inspired by their own works of art. Look at images in figurative works of art and predict what might happen next, telling what clues in the work support their ideas. Perceive and describe contrast and emphasis in works of art and in the environment. Describe how negative shapes/forms and positive shapes/forms are used in a chosen work of art. Identify pairs of complementary colors (e.g., yellow/violet; red/green; orange/blue) and discuss how artists use them to communicate an idea or mood. Describe the concept of proportion (in face, figure) as used in works of art. Describe and analyze the elements of art (e.g., color, shape/form, line, texture, space, value), emphasizing form, as they are used in works of art and found in the environment. Use the conventions of facial and figure proportions in a figure study. Use additive and subtractive processes in making simple sculptural forms. Use accurate proportions to create an expressive portrait or a figure drawing or painting. Use the interaction between positive and negative space expressively in a work of art. Use contrast (light and dark) expressively in an original work of art. 3.1Describe how art plays a role in reflecting life (e.g., in photography, quilts, architecture). Identify and discuss the content of works of art in the past and present, focusing on the different cultures that have contributed to California’s history and art heritage. Identify and describe how a person’s own cultural context influences individual re­sponses to works of art. Identify and describe how various cultures define and value art differently. Describe how the individual experiences of an artist may influence the development of specific works of art. 5.1Select a nonobjective painting, work in small groups to interpret it through dance/ movement, and then write a paragraph reporting on the arts experience. Identify through research twentieth-century artists who have incorporated symmetry as a part of their work and then create a work of art, using bilateral or radial symmetry. Construct diagrams, maps, graphs, timelines, and illustrations to communicate ideas or tell a story about a historical event. Read biographies and stories about artists and summarize the readings in short reports, telling how the artists mirrored or affected their time period or culture. Identify and describe characteristics of representational, abstract, and nonrepresenta­tional works of art. Use their knowledge of all the elements of art to describe similarities and differences in works of art and in the environment. 2.1Use one-point perspective to create the illusion of space. Create gesture and contour observational drawings. Create an expressive abstract composition based on real objects. Assemble a found object sculpture (as assemblage) or a mixed media two-dimensional composition that reflects unity and harmony and communicates a theme. Use perspective in an original work of art to create a real or imaginary scene. Communicate values, opinions, or personal insights through an original work of art. 3.1Describe how local and national art galleries and museums contribute to the conservation of art. Identify and describe various fine, traditional, and folk arts from historical periods worldwide. Identify and compare works of art from various regions of the United States. View selected works of art from a major culture and observe changes in materials and styles over a period of time. 4.1 Identify how selected principles of design are used in a work of art and how they affect personal responses to and evaluation of the work of art. Compare the different purposes of a specific culture for creating art. Develop and use specific criteria as individuals and in groups to assess works of art. Assess their own works of art, using specific criteria, and describe what changes they would make for improvement. 5.1 Use linear perspective to depict geometric objects in space. Identify and design icons, logos, and other graphic devices as symbols for ideas and information. Research and report on what various types of artists (e.g., architects, designers, graphic artists, animators) produce and how their works play a role in our everyday environ­ment. Identify and describe all the elements of art found in selected works of art (e.g., color, shape/form, line, texture, space, value). Discuss works of art as to theme, genre, style, idea, and differences in media. Describe how artists can show the same theme by using different media and styles. 2.1Use various observational drawing skills to depict a variety of subject matter. Apply the rules of two-point perspective in creating a thematic work of art. Create a drawing, using varying tints, shades, and intensities. Create increasingly complex original works of art reflecting personal choices and in­ creased technical skill. Select specific media and processes to express moods, feelings, themes, or ideas. variety of resources (both print and electronic). View selected works of art from a culture and describe how they have changed or not changed in theme and content over a period of time. 4.1Construct and describe plausible interpretations of what they perceive in works of art. Identify and describe ways in which their culture is being reflected in current works of art. Develop specific criteria as individuals or in groups to assess and critique works of art. 5.1Research how art was used in theatrical productions in the past and in the present. Research how traditional characters (such as the trickster) found in a variety of cultures past and present are represented in illustrations. Create artwork containing visual metaphors that express the traditions and myths of selected cultures. Describe tactics employed in advertising to sway the viewer’s thinking and provide examples. Establish criteria to use in selecting works of art for a specific type of art exhibition.